Build up play is an increasingly discussed subject in football at the moment. The influence of Pep Guardiola’s footballing philosophy and principles has led to the majority of football fans having an opinion on the concept of build up play. Seemingly everyone has an opinion on whether or not building attacks from the goalkeeper with short passes is good or stupid. Some believe the latter, and prefer to see their goalkeeper start play with a long ball to reduce the risks of losing possession close to their own goal. Others, like well-known coaches such as the aforementioned Guardiola, Ricardo La Volpe, Maurizio Sarri and Juanma Lillo would defend their ideals of building attacks from the back forever. This article will discuss an interesting method for building attacks currently implemented by Inter coach Luciano Spalletti. But first we must answer an important question; is build up play the same thing as building from the back? First we need to determine what “build up play” is. 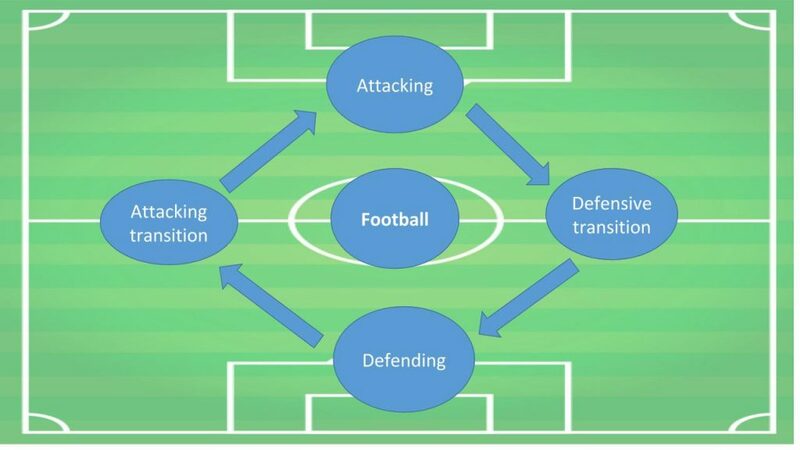 Football can be divided into four phases; attacking, defending, transition from attack to defence and finally transition from defence to attack. 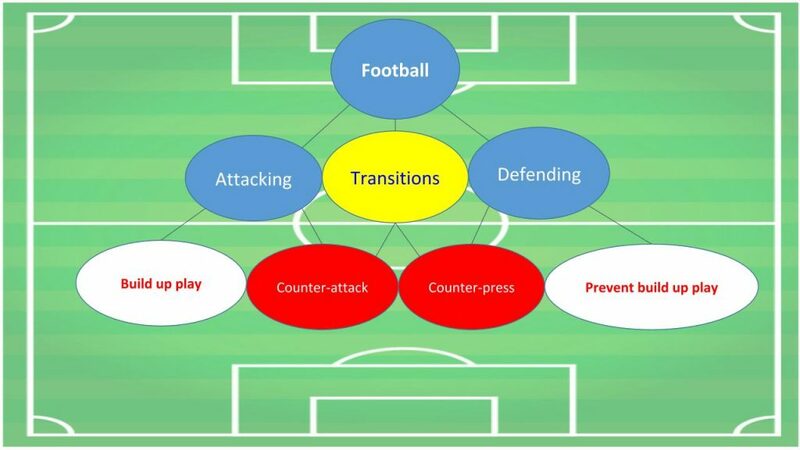 These phases can then be divided further; within attacking is build up play and counter-attacking (attacking transition), within defending is counter-pressing (defensive transition) and preventing build up play. If one team is in the attacking phase and use build up play then the opponent is in the defensive phase and are preventing build up play. If one team has just won possession and try to counter-attack before the opponent is organised then the opponent are counter-pressing, either actively (they press the ball) or inactively (they retreat to defend space). This is the game of football and the phases are always entwined in this way; you can’t counter-attack against a team in an organised defence looking to prevent build up play and you can’t counter-press a team who builds up play as the purpose of counter-pressing is pressing straight after losing the ball. Simply put, build up play is the phase of play when a team has possession of the ball and tries to score while the opponent is in an organised defence. So a long ball from the goalkeeper or a defender towards a striker is build up play just as much as a flowing team move of 72 short passes in a row. This means every single football team on the planet practices build up play in some moments of every match they play, regardless if the coach is called Guardiola or Tony Pulis. Building from the back however, is something different. It’s practised in the phase “build up play” but the difference is that building from the back is a method implemented by coaches who believe the best way to score goals and win matches is to start attacks from their own goalkeeper or defence and then consciously move the ball forward before creating a goal scoring opportunity. So now that we have determined the meaning of two terms often misunderstood and mixed up we’ll move into building from the back in practice. This term is often used to describe the most common way of building from the back. The term refers to a concept used by the Argentine coach Ricardo La Volpe and therefore means “La Volpe’s exit”. In La Volpe’s method, he would make sure a player dropped into defence to create a numerical advantage against the first line of the opponent. For example, if La Volpe had two centre-backs and came up against two strikers then the centre-backs would split and a midfielder would drop in between them to create a 3 vs 2 situation against the strikers. It’s actually 4 vs 2 when including the goalkeeper but you understand the concept. The idea is to always have an extra player to help the progression from the first line of the formation into the second and the dropping midfielder creates this numerical advantage. Pep Guardiola is possibly the most known advocate of La Salida Lavolpiana and made the concept famous with his superb Barcelona side of 2008-2012. You can see the concept in practice in the video below where Sergio Busquets drops in between the two centre-backs to create a 4 vs 2 against Juventus’ strikers to help progress the play. For more on La Salida Lavolpiana from ESDF Analysis you can read this and this. This brings us to the purpose of this article; Luciano Spalletti’s method to build from the back at Inter. From his time at Roma, we’d already grown accustomed to his preference to build from the back but usually he used a flexible backline. Out of the four defenders, one full-back would push on high while the other stayed back with the centre-backs to create a back-three in possession to have coverage of the central zone as well as both half-spaces. He also created a numerical advantage in this way as most teams pressed with one or two strikers and he kept three defenders in the first line. Inter’s signings this summer had Spalletti written all over them; Slovakian centre-back Milan Skriniar is excellent at starting attacks with vertical passes through lines of pressure and midfield duo Borja Valero and Matias Vecino are both extremely comfortable in possession. The signs were clear; Spalletti wanted to improve Inter’s play in possession and wanted to build from the back. In their last two league matches, Inter have gone up against SPAL and Crotone, two teams who start their press with two strikers. Inter have lined up in a 4-2-3-1 formation in both games with both full-backs providing width leaving the centre-backs in a 2 vs 2 situation against the two strikers. Instead of the situational back-three Spalletti created at Roma, he’s used his own version of Salida Lavolpiana. His ploy has been to have one of the two central midfielders move from the centre towards the half-space and outside the two strikers. From this position the midfielder becomes an easy passing option for the centre-backs, is out of reach for the strikers to press and creates a problem for the ball-near central midfielder and winger of the opposition. They don’t know who should press. If the central midfielder goes, Inter’s number 10 has more space but if the winger goes, the full-back becomes an easy option to use for Inter to progress the attack down the side. The video below highlights the method and how Inter try to exploit the space either wide (as in the first clip) or behind the opponents midfield (as in the second where Crotone’s man-orientated pressing is exploited). It’s an interesting method to use, particularly since it’s very difficult to press, especially in a 4-4-2. The idea is to create a free man and it usually pays off as opponents struggle to figure out how to deal with the movement of the midfielder. Other teams have used similar methods to free midfielders of markers, notably Zinedine Zidane’s back-to-back Champions League-winners Real Madrid and the early Borussia Dortmund under Thomas Tuchel. The first time I noticed the ploy was through the IFK Luleå of Fredrik Waara and Andreas Pettersson who consistently dropped one midfielder into the half-space outside the opponents strikers while the other stayed centrally like Spalletti’s Inter does. That was back in 2012 in Sweden’s third division but my club Bodens BK struggled badly in three consecutive regional cup finals to stop the progression of the ball. The method is particularly effective against teams defending in a 4-4-2 structure as the confusion regarding who should press the midfielder causes teams to make mistakes and vacate more threatening space. Similarly, teams defending with clear man-orientations who man-mark midfielders will struggle as one midfielder will follow the movement of the opponents midfielder leading to the defensive team vacating space centrally where the attacking team can possibly find a central pass to a striker or number 10. To conclude, this post has looked at the concepts of build up play and building from the back, what the terms mean and two interesting methods used to progress play from the goalkeeper or defensive line. There are plenty of other ways to build from the back but La Salida Lavolpiana is by far the most used method and Spalletti’s method at Inter presents intriguing possibilities for their attacking play.